One of my favorite breakfast choices is granola. I have tried just about every brand of it and generally like them all. But most store bought granola has extra chemicals and I would rather not eat processed food. Making your own is a good choice if you feel this way too. 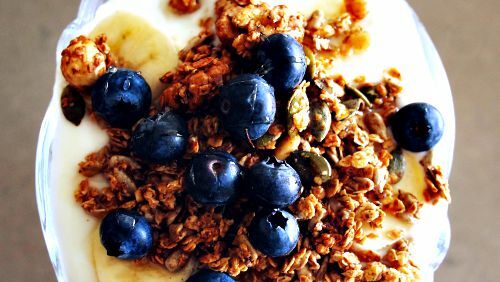 This recipe for stove top granola is delicious and uses honey and brown sugar for sweetening instead of refined sugar and has lots of healthy fiber. An added benefit is that this is one of my 30 minute meals. Make Your Own Stove top Granola. The granola is made in two steps. First the rolled oats and oil are combined and cooked and then cooled. The second step is to combine the butter, brown sugar, honey together. The the rolled oats are combined and the nuts and dried fruit are added last. You can make this with any dried fruit that you prefer and use your favorite nuts too. All work very well. Store in an airtight container and serve with yoghurt and fresh fruit for a tasty alternative to store bought granola. Start by heating the oil in a skillet on the stove, over medium high heat. Add the rolled oats and cook until it starts to brown and crisp, stirring often for about 5 minutes. Removed from the heat and place on a cookie sheet to cool. In the same pan melt the butter. Stir in the honey and brown sugar and cook until it is bubbly, stirring the whole time. Stir the cooled oats back into the pan. Continue cooking for another 5 minutes. Pour back onto the cookie sheet and spread the mixture and allow it to cool. When the mixture is cooled, transfer to a container. Stir in the almonds and dried cranberries. If you, like, you can now add other nuts and dried fruit. Seal the container.